KFC is known for the best fresh fried chicken (Finger Lickin’ Good!) all over the country. The Colonel is a wonder at making our chicken, sandwiches, and classic sides so delicious. When we get that memorable Bucket, the kids go crazy, they know that they are going to have a tasty treat. They enjoy the Extra Crispy, while I enjoy the Original. Whatever type you like, the KFC near you is always ready to serve you. Use the link to get the coupons in your area and you are on your way to the perfect meal to take home, or even take out to the beach, camping, or any other adventure your family is planning at the moment! Quiznos Sandwich Restaurants have so much stuff to enjoy. Their menu is chef inspired so you know you are really getting a great assortment of tasty and fresh food. They even have over 25 new items on the menu now. They are famous for their wonderful sub sandwiches.. My favorite right now is the Steak House Beef Dip, it is so amazing. Quiznos also have extremely good salads and wraps, grilled flatbreads, soups, desserts and even breakfast. You can go online on their site and check out the entire menu, and while you are there, place your order and so conveniently, it will be ready when you arrive to pick it up. Find the nearest Quiznos as well online. Quiznos offers gift cards for sale, and you can get them for anyone for any occasion you want to give a special gift. They also have the Q Club, and you can join very easily online if you like. Get great deals when you join. Always an offer on the Quiznos site. For your big get together with your friends and family, have the food that everyone will enjoy. You just can’t beat that. Catering is always done for you at Quiznos. Mmmmm, Cinnabon!! Every time we walk into our local mall, the first thing we smell is the fantastic scent of the Cinnabons baking. Always a final stop before we leave for home, we are sure to pick up our oh, so delicious treats. Warm, melt in your mouth, cinnamonny treats, and we can never resist visiting their sttore. Plus, you always know they will put a big smile on the kids faces 🙂 And Mom’s!! 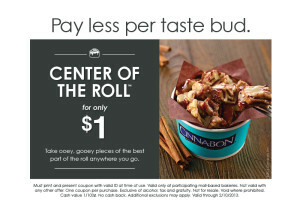 Get the new “Center of the Roll” at Cinnabon for just $1 for a Limited Time! This coupon is good at participating mall-based locations only. You have until February 10, 2013 to get this deal. The best part of the Cinnabon is the middle of it anyway, so why not order just that! The Center of the Roll gives you the “ooey gooey” center that we all shop at Cinnabon for. Are you in the need for entertainment and dining ideas that are quick and easy? Looking for some great discounts that you can enjoy with your family and friends? Check out the deals you can get from Groupon today! Get out and do something crazy and fun this weekend, have a blast! Get discounts on food, bowling, movies, even spa treatments when you visit the Groupon Website. Find the best local deals in your neighborhood and have the family join in for a great treat. When you add Groupon to your daily emails, they will send you plenty of deals to choose from. I always check Groupon out first for the best discounts and deals before I do anything. Saving money these days is getting easier and easier with Groupon deals! Boston Market is one of my favorite fast food places. Just thinking of their tasty treats makes my mouth water. Order a $25 gift card online and get one of my favorites, a freebie! You can get it either way you like, an instant gift card that will be delivered to any email address, or mobile phone. 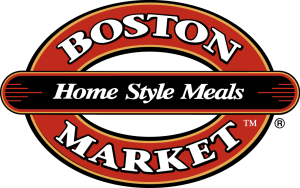 Purchase you Boston Market gift card, and if you order online, you are entered into a drawing to win $1000!! Gift cards can be personalized with photos, recorded messages, and are even able to be uploaded on Facebook. The Boston Market site has the tool to check gift card balances anytime. 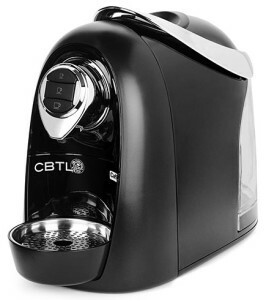 You can also order online while you are there and find the closest location if needed. The traditional plastic gift card can be purchased online and can be personalized as well. If you are in a rush, the cards can be expedited to your recipient. So, order your gift cards now so you can get the added bonus of the $5 card!